LIKE us AT Facebook! Share and learn tips, techniques, gear and more! Yosemite National Park camping Our experience, gorgeous pictures and more! 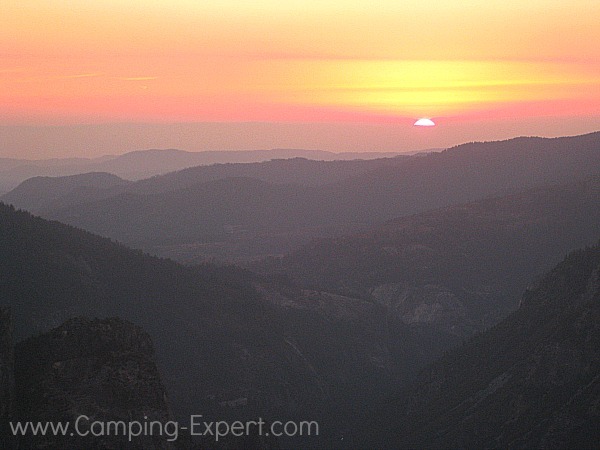 Yosemite national park camping is Amazing, I’ll share why we loved it, with great hikes and amazing photos (including half dome). You’ll want to visit now! Yosemite is one of the classic National parks, with the Half dome, gorgeous views, and amazing hikes, it’s no wonder that it’s such a popular park. We visited Yosemite National Park near the end of September, and it was still SUPER busy. All the Yosemite national park camping grounds were full (so we camped on national forest land for free, although it had no amenities, but we were prepared). 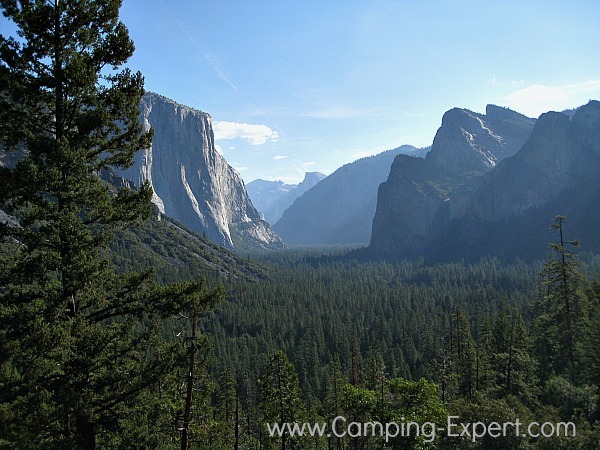 So make sure, if you are planning to visit, that you book YOUR Yosemite national park camping sites in advance. Did I like it? Yes!! Of course, it was a beautiful park with lots to do and some incredible views. Some of my best scenery pictures were taken at Yosemite. If you like views, and aren’t incredibly afraid of heights, then you’ll truly love Yosemite. There are so many gorgeous views. If you want an easy 360 view, then Hiking up Sentinel Dome is perfect (elevation of 8122 feet). It is a distance of 1.8 km/ 1.1 miles, and gives you a 360 view of the half dome and area. It is recommended to do at sunset, which is when we did it, and we would recommend it then too. The view is pretty hard to beat! If you’re more interested in shorter hikes there are many shorter and less strenuous walks along the valley. There is also Tenaya lake which you can sunbathe near or go swimming in. 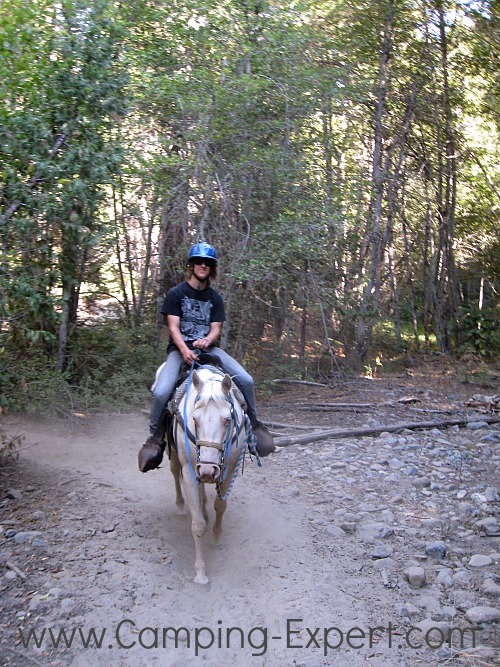 We also went horseback riding at Yosemite Trails ranch at the south gate. It is a 3-generation ranch, with many horses that are absolutely beautiful, very well taken care of, and well mannered. We did a 1hour ride and thoroughly enjoyed ourselves. There are many different tours that you can do with the horses. 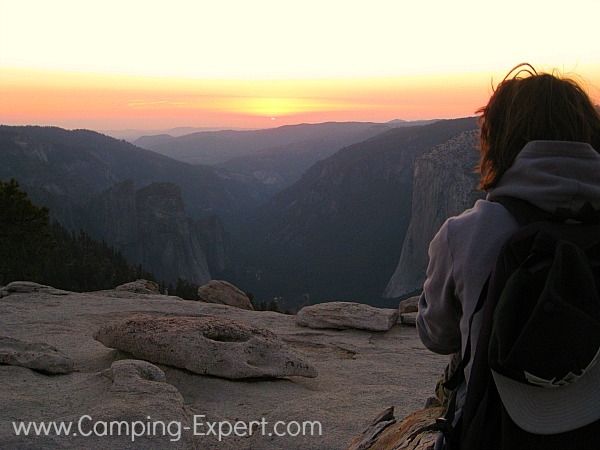 Hike the famous Halfdome when you are at Yosemite National park Camping. To hike up the half dome you need a permit. These are given out on a lottery system. They give out several hundred permits per day in the pre-season lottery (approx. 300/day). During the actual season and if you don’t have a permit when you arrive, they draw approximately another 50/day. To be put in the draw during the season, you have to apply two days before your hike. If your name is drawn, you will be told the night before you hike. The halfdome generally takes around 2 days and campers camp half-way along the trail. 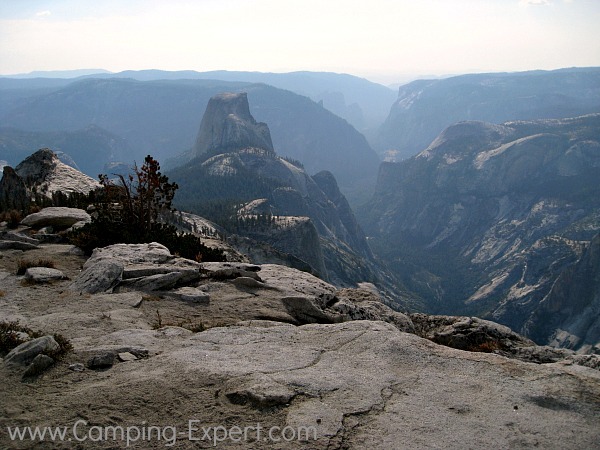 There is a fee for the half-dome Yosemite national park camping permit. But… if you rock-climb, you can rock-climb to the top of the halfdome, and can take the regular trail down without a permit. Since we were on a mission to hit many National parks, we decided to hike Clouds Rest which overlooks the Halfdome (picture above), after a fellow camper had recommended it..
Clouds rest is about a 14 mile/22.5km (round trip) hike up and down a giant mountain with an elevation of 9926 feet, which overlooks Halfdome. The view from the top is definitely worth the hike, but the hike is meant for those in shape. The hike can be hiked in 1 day (there and back) if you are in decent shape and ok with the elevation, or it can be made into a multiple day backpacking trip. It took my brother and I about 6 hours to do the hike, but make sure to give yourself from 6-8 hours (or more) based on how long other hikers said it took them. People that did it as a multiple day trip camping trip, got a back-country permit, camped first at Sunrise- a back-country Yosemite national park camping area, and then hiked up to Clouds rest the following day. The view once at the top is pretty amazing (as you can see above and below), you are looking OVER the half dome, and have 360 views of mountains, rock and valley. INCREDIBLE! Beyond Sunrise camp area, there are many other wilderness trails that you can do, and these also require a permit. 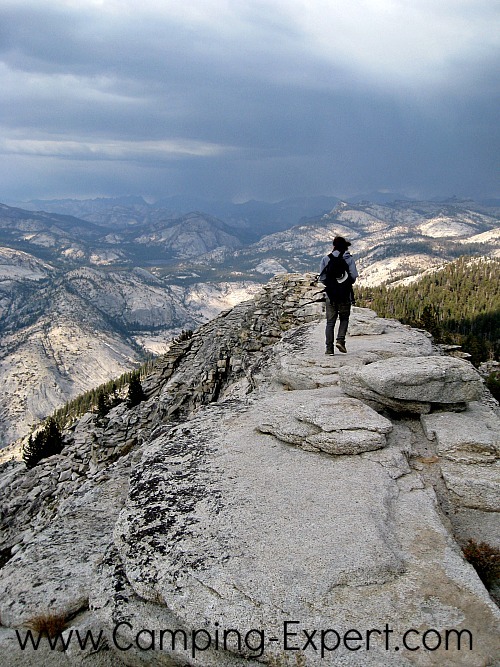 If you love hiking, there are so many amazing areas to hike- from meadows, waterfalls, valleys, up cliffs, mountain views, or forests of giant Sequoia trees. There are so many choices of hiking trails, all with amazing views! What else is there to do in Yosemite? Well, there is LOTS to do! Some other things that you can do in Yosemite, are: Rafting, fishing, bicycling, rock climbing, Ranger hikes and presentations, art workshops, Yosemite Pioneer history center, Mariposa Grove museum, photography classes. There are SO many things to do in Yosemite, that it’s worth it to just book a site, or just arrive and see what you’ll enjoy! The park is even set up to deal with many disabilities such as wheel chairs, deaf and sign language interpreting, and audio tours. You may need to book in advance so they can prepare for special needs. If you want to see the waterfalls in the park, those are better captured earlier in the season as they don’t flow as much later in the season. Yosemite is a very popular park even into the fall season, so I can hardly imagine visiting it in the summer. Someone working there described it as ‘crawling with ants’. Camping in Yosemite is one of those places where you need to book far in advance to actually get a site inside the park. Since it takes so much time to travel from one side of the park to the other, it is important that you book a site, otherwise you’ll be spending a fair chunk of each day driving from the national reserve camping areas outside of the park to get to a hiking spot inside the park. 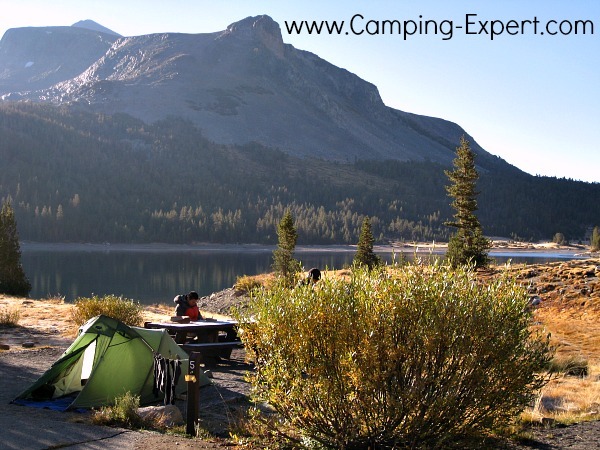 Also…There is camping outside of the park, at a free national park area (at the south end), and also at the Inyo national forest which is cheaper than in the park at only $19 (pictured below)! Spending time at Yosemite national park camping is not a cheap place to spend time, but it is worth it. Yosemite is a large park, and, although most National parks cannot be explored in a day, Yosemite is meant to be a several day excursion at minimum. There is SO much to see and do! Where Do You Love To Camp? Where do you love to camp? A favourite park? Where? What do you love about it? What do you love to do when you're there? Share it! Click here to see the rest of the form and share your camping park. I promise to use it only to send you Camping Tips E-Zine. Check out my NEW Wilderness Recipe Ebook! !